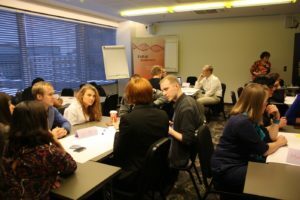 For the third year in a row, during the first week of December, bright young entrepreneurs gathered in Tartu where Tartu Biotechnology Park and Tartu City Government held the international hackathon in biotechnology – sTARTUp 2017 BioTech. This event helps early stage startups in biotechnology, medicine and veterinary medicine to test and refine their idea among other entrepreneurs and to go in depth with experienced mentors. To start the day, three mentors gave a short talk on the latest developments in the field – Anton Adamovitch presented the view of a young entrepreneur to showcase his company Conelum. Dr. Neil Thomas from Ventac Partners spoke about value creation and business models based on intellectual property. As the third speaker, Mindaugas Plieskis gave an overview of Johnson&Johnson Innovation activities and interests. The second half of the day belonged to the hackathon. 15 teams entered the competition for the 10 spots to participate in the hackathon and to compete for the two main prizes – 1000 EUR for the winner of sTARTUp 2017 BioTech and 100 EUR for the Best Pitch prize while both also received a consultation package from Tartu Biotechnology Park and an invitation to pitch on the sTARTUp Day 2017 (www.startupday.ee) on Starlight stage to perform their pitch as one of the Best pitches of sTARTUp Day – in addition to working with the mentors and getting feedback from other teams. After thorough mentoring sessions the teams gathered for their final pitch in front of the jury of mentors – Andrus Tasa (Tartu Biotechnology Park), Neil Thomas (Ventac Partners), Thomas Schmit (Enixus), Olga Tšubrik (TBD Biodiscovery), Anton Adamovitch (Conelum), Maarika Merirand (Connected Health Estonia), Anneli Simm (Teligent), Gunars Kisis (Association of Latvian Young Scientists), Anna Gran (Johnson&Johnson Innovation) and Mindaugas Plieskis (Johnson&Johnson Innovation). Due to the high level of competition it took some time to pick the winners, but after some heated discussions the jury chose Moldovan team Cerebro for the Best Pitch prize and Latvian team DERMA Skinviewer as the winner of the whole event. The exciting day ended with the Final Ceremony to announce the winners, give out prizes and make pictures (https://photos.app.goo.gl/GzTYgUdDQPafcSdg2). sTARTUp Day Biotech Hackathon will be back in January 2019 to provide the next group of teams the opportunity to make contacts, get feedback from experienced mentors and win prizes.